Ranking well for your target keywords is getting harder and harder. As Google and other search engines consistently make updates to increase the quality and user experience of the results they present users, mediocre, and even really good content gets surpassed by content that is simply amazing. This content goes above and beyond other content. It delivers a full solution to a problem, not just talking points, and becomes a cornerstone of an industry. It’s called 10x content. Getting a piece of content to rank well in search used to require writing a good, unique, 400-800 word blog post, optimizing on-page SEO, getting some links back to the post, and voila! it would start to rank well. That tactic isn’t hard to do. So SEO’s around the world starting doing it – a lot. Soon, search results were filled with good, unique content. Then, savvy SEO’s and content marketers realized that if they created GREAT pieces of content, they would outrank the good content written by everyone else. This game of one-upmanship culminated in what Rand Fishkin, Founder of Sparktoro and Moz, coined as 10x content. 10x content gives audiences a full solution to their problem, often taking a unique approach to solving the problem, or answering the problem so thoroughly that it would be hard for any competitor to top. So all it takes to rank highly for a keyword you want to target is to write a piece of content that becomes the defacto standard that the rest of your industry can rely on. As much as we want to think that should be relatively attainable, it is actually really hard to do. Identifying what topic matters most to your audience, and then crafting an amazing piece of cornerstone content around it, is time consuming, expensive, and has no guarantee that what you craft will be what your industry truly needs. Simply creating a long piece of content doesn’t mean that it’s a) exceptional, b) fulfills your audience’s needs, or c) that you’re able to get it enough exposure to make people really notice it. 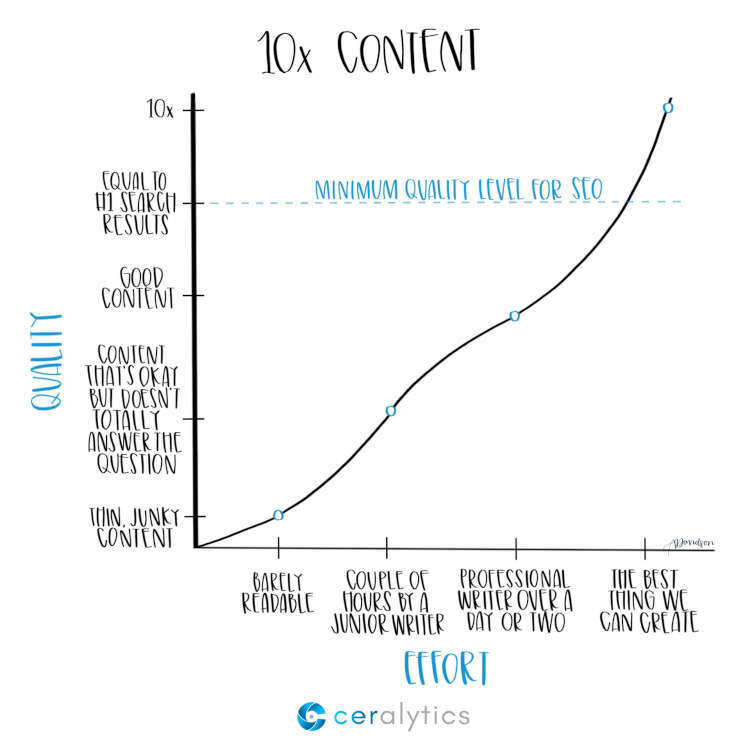 Also, 10x content is almost exclusively about topics that people with a “Know” search intent. Making your product or services pages 6,000 word monster posts won’t necessarily be helping someone who simply wants to have someone fix a problem they have with a “Do” query. 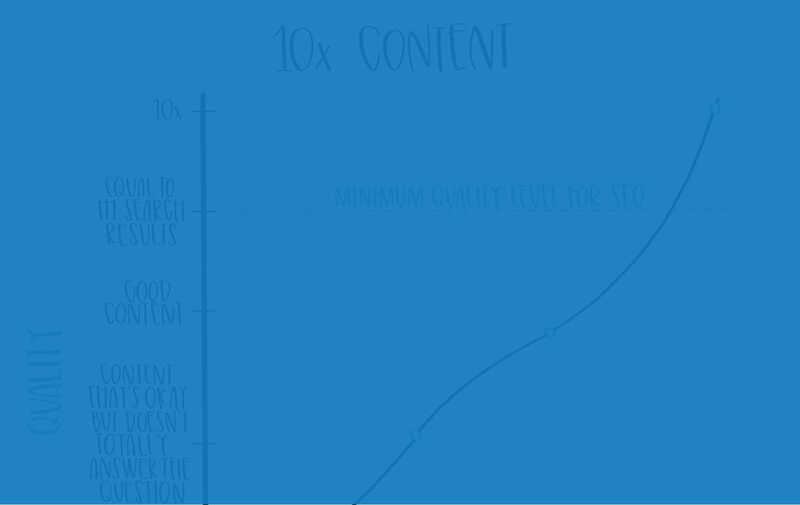 Making 10x content a part of your overall content marketing effort doesn’t mean you’ll be exclusively creating 10x pieces of content. In our Ultimate Guide to Content Marketing Campaigns, we lay out how 10x content becomes cornerstone content that is supported by other content within a campaign. This supporting content takes all shapes and sizes, but ties back to the cornerstone content to help the cornerstone content garner a larger audience and rank well in search. 10x content also shouldn’t completely replace smaller pieces of content such as newsletters, regular blog posts, etc. if those pieces of content are driving good awareness and engagement on your site. Instead, it should just be one of the tools in your content marketing arsenal. Another key to 10x content is that it should only be created for the keywords that you know will drive the right audience to your site. Don’t waste your time creating a huge piece of great content if the audience it’s going to pull in isn’t remotely interested in what you’re selling. Take a look at the content you currently have. How well does it rank in search? Are there any industry terms that you feel you should be ranking well for, but currently aren’t? If they are “Know” queries, they may be good candidates for 10x content.